The Patriotic Mini’s Fabric Collection for Connecting Threads all started with a sketch. I always carry a sketchbook and a bag of pens with me wherever I go. It’s a habit that I started as a little girl when I was bored in restaurants and it just stuck. This may seem off topic, but it relates–I promise (keep reading!). Last summer I lost my cell phone. I was trying to avoid having to go into a store to get a replacement, so I was on hold with our phone carrier’s customer service department for a looooonnnnnng time. It would have been so infuriating had I not had my sketchbook! Independence day was just a few weeks away and was obviously on my mind. I absentmindedly started drawing stars and stripes and fireworks as I attempted to replace my lost cell phone. In the office the next week, I was talking to Mari (our beloved quilt designer!) who really urged me to add color and turn the patriotic little doodles into fabric. The focal fabric of this collection, Flag Waving, started as a doodle in my sketchbook. Once I started adding in the color, I got really excited. The hand-drawn quality of the lines looked so perfect in an antiqued shade of ivory. The heaviness of the black pen lines just disappeared when I colored it up in red, white and blue. I absolutely love the way the focal print of this collection turned out. It’s a busy, packed design with lots of texture, and lots of lines going every which way, but somehow it works! It really looks great in the projects it was used in. I especially love how it looks in the center square of the star motifs on this Patriotic Mini Quilt Kit by Mari Martin. 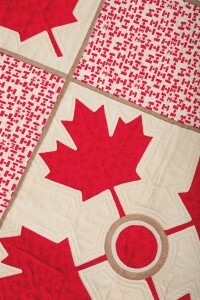 We wanted to give our neighbors to the north some rightly deserved love, so we made a Canadian Flag fabric, too! Some sweet projects sewn up in Patriotic Minis Fabric. I am always surprised and amazed by where creative ideas come from and how they grow up into products on the pages of our catalog. If it hadn’t been for the hassle of a lost cell phone and a supportive co-worker, these little sketches would probably never have become one of my favorite self-designed Connecting Threads collections. So THANK YOU to long customer service wait times and to my good friend and colleague, Mari Martin! Thank you for thinking of your Canadian fans. It makes my heart sing! I know there are a lot fewer of us but we love our country as much as you do yours. I enjoyed this peak into the creative process – and the resulting quilt block. Thanks a bunch.